I’ll show you a very easy technique for taking highspeed photos. For this tutorial you don’t need any special equipment, just the cam and your flash. On the last tutorial we saw, that one can use a flash to freeze motion. But the main disadvantage of the last tutorial was, that you’re only able to use HSS flashes. This is exactly why we need this technique, because on this technique, you can use whatever flash you have. The cam is setup in a dark room, with longtime exposure (or bulb) and in the key moment, we’re firing the flash manually. As we are in a dark room, the camera isn’t recording anything (expect black) as long as there is no flash. As soon as we trigger the flash, it will get bright for a short moment and the camera captures that moment. Even if the cam was recording a picture of several seconds (red rectangle), the only thing we can see on the final image, is the moment we triggered the flash (blue rectangle). Depending on the flash and the power setting of the flash, this will be as short as 1/20’000s. This duration is much shorter as we could get it with the shutter. Therefore we’re able to freeze much faster motion. The duration of the flash depends on the power setting. If we use a high power setting, we have a long flash duration, if we use a low power setting, we have a short flash duration. At full power we have a flash duration of 1-2 milliseconds, but at 1/32 power we have a flash duration of about 1/20 milliseconds, which is about 50 microseconds. As already mentioned, we’ll use longtime exposure on our cam, I’d suggest somewhere around 4-10 seconds. To get a higher depth of field, we use a aperture of about 10-14. We use the flash at a very low power setting, to get a short flash duration to freeze our motion. 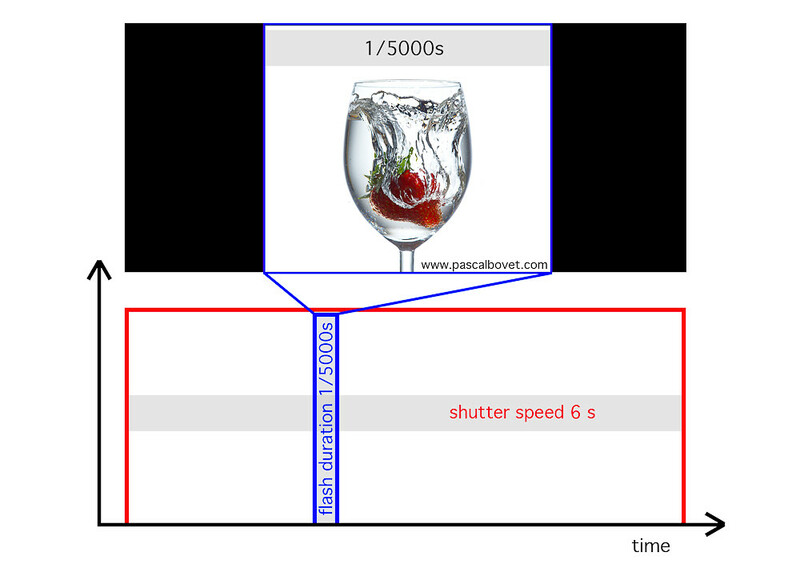 We shouldn’t use the flash at full power, because then we have a flash duration of several milliseconds, which could already be enough to get motion blur. 1) Take an image without triggering the flash. This image should be totally black. If this is not the case, we have to much ambient light. You should try to minimize the ambient light, or if this is not possible, you can choose a smaller aperture (smaller aperture = higher number). 2) Take an image with firing the flash, but without action. For this image I just placed the strawberry in the glass and changed the position and the power settings of my flashes until I was happy with the result. As soon as you’re happy with your lightning setup, we can capture the action. As already described, it is very easy. First I triggered the cam, then I dropped the strawberry in the water and just before the strawberry hit the water I fired the flash manually. It is important that you don’t fire the flash with the cam, you trigger the flash manually. Surely not every attempt will be successful, sometimes you’ll trigger the flash to early, or to late, but with some practice you’ll get great results. For this tutorial I made about 30 photos, 15 are okay (strawberry in the moment of hitting the water) and about 5 are great (everything looks good). There was also a reason for choosing this section. 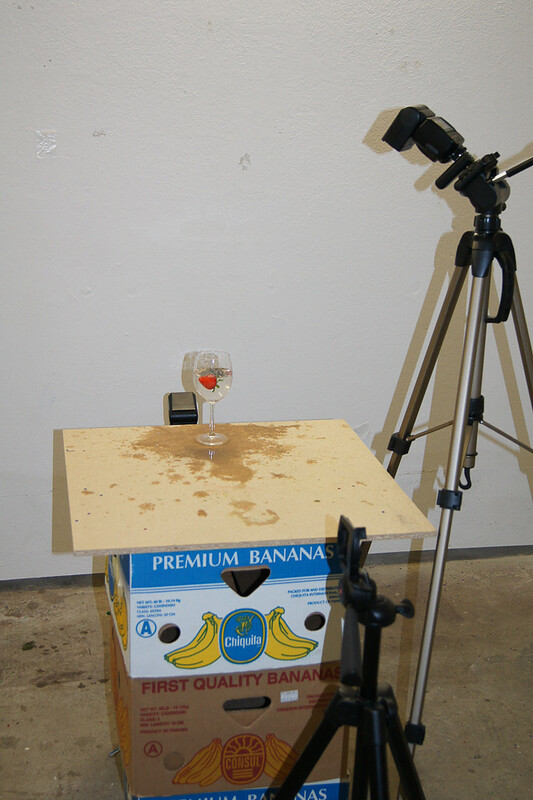 If I’d taken an image of the whole glass, I’d have to clean up the table after each attempt and setups where you have to clean up after each attempt are very time consuming. I don’t say that it’s not possible to take such pictures with this technique, but you’ll need a lot of time and patience. Above I wrote that we’re taking this image in a completely dark room, well it wasn’t completely dark, in a completely dark room I wouldn’t be able to see the glass. I pointed with a flashlight on the opposite wall. Just bright enough to see something, but not as bright as the picture without flash wouldn’t be black. If you don’t want to put your hands on your flash every time, you can use a remote trigger to fire your flash. It’s important that you’re triggering the remote trigger manually, it’s not the cam which is triggering the remote trigger. If you don’t have a remote trigger, no worries, it will also work without. If its to bright, its not possible to exposure long enough, without getting ghost images.. This happens also if the object is very bright, as a light bulb. With long exposure times it is not possible to make sequences. If you use this technique, you’ll get one image per attempt. This technique is universal applicable and I used this technique in most of my images. As you can see on the example images, you can use this technique for highkey (white background) as well as lowkey (black background) images. The brightness of the background is controlled by the settings of the flashes. With the correct technique it is very easy to take highspeed photos. I think that this is the most important technique for highspeed photography. YOU? Have you tried this technique? Please let me know if you succeeded or not. Super, danke, Daumen hoch, super tut echt klasse. Ein sehr verständliches Tutorial mit tollen Bildern. Vielen Dank dafür!